Discussions of Kansas stratigraphy in this report are based mainly on subsurface information supplemented by surface data. Descriptions are necessarily brief and generalized. It is absolutely essential, however, in understanding the tectonics of the region, to have knowledge of the types of lithostratigraphic units involved. Detailed lithologic descriptions of stratigraphic units are necessary in correlation for determining time relations of events of regional nature, but gross lithologic descriptions are adequate for understanding and interpreting structure and structural development. Rocks in Kansas range in age from Precambrian to Quaternary. Although at no one place in Kansas is there a complete, representative geologic section, all post-Precambrian systems are represented (Fig. 2, 3, 4, 5). Figure 2--Composite stratigraphic section of rocks present in kansas, Beds older than Mississippian are known only in subsurface (modified from Moore and others, 1952). A larger version of this figure is available. Figure 3--West-east cross section from Cheyenne County to Doniphan County showing stratigraphic relation of major units (from Merriam and Hambleton, 1956). Numbers refer to wells listed in Appendix F. A larger version of this figure is available. Figure 4--West-east cross section from Sherman County to Johnson County showing stratigraphic relation of major units (from Merriam and Hambleton, 1959). A larger version of this figure is available. Figure 5--West-east cross section from Morton County to Crawford County showing stratigraphic relation of major units in Kansas. A larger version of this figure is available. The section of sedimentary beds in Kansas is relatively thin as compared with geosynclinal troughs and the deeper basinal areas such as the Denver or Anadarko Basins. The maximum thickness of sedimentary rocks in the deepest part of the Kansas portion of the Hugoton Embayment is only about 9,500 feet. When viewed in proper perspective, the sedimentary strata appear almost as a veneer covering the Precambrian basement complex, which is, of course, nothing more than an extension of the Canadian Shield area. Also as compared with geosynclinal areas, the stratigraphy is simple, and this succession of many thin beds of sediments has been compared to that of a layer cake. The dip of beds, except in small "pseudostructures," such as those due to slumping into solution cavities, is known not to exceed 10 degrees (Jewett and Merriam, 1959). The reader must constantly keep in mind the unavoidable distortion, caused by vertical exaggeration, that is necessary in order to present the data graphically (see especially Dallmus, 1958). Stratigraphic emphasis has been placed on outcropping rocks of Kansas and their correlation in the subsurface. Because of this, Cenozoic, Mesozoic, and upper Paleozoic rocks are treated in more detail than lower Paleozoic units. Also, because of the importance of the Precambrian in forming a base for all subsequent developments, it is given a more detailed treatment. With few exceptions, all major surface units have been examined in the field in order to recognize the more important characteristics of each unit. In this report correlation of subsurface rock units is accomplished mainly by a combination of (1) lateral tracing of certain persistent key beds, (2) notice of the similar lithology of units, and (3) observation of like sequences of stratigraphic formations. In Kansas, little or no use is made of fossils or faunal assemblages in subsurface correlation, except where they may be obtained from cores, although distinctive fossils may be used in picking tops from rotary and cable-tool well samples. In this respect microfossils have considerable value for correlation and for mapping. Most useful in correlation are electric and radioactivity logs, which portray, respectively, the electrical and radioactive properties of the rock. These properties may be characteristic of individual beds over large areas; for example, the Stone Corral Formation of the Sumner Group (Permian), which in the subsurface is composed chiefly of anhydrite, has a characteristic electric-log peak by which it may be traced from the outcrop in south-central Kansas into eastern Colorado. The double-pronged "kick" at top of the Greenhorn Limestone (Upper Cretaceous) may be traced over several states and as far as eastern Wyoming. These persistent beds are used as datum horizons for structural mapping and in the construction of isopachous maps. Where characteristic beds can be followed, facies changes and changes in thickness between them may be interpreted with some degree of accuracy. Thin beds of limestone, anhydrite, bentonite, and volcanic ash, which are persistent over wide areas, may serve as excellent time-marker horizons. A bed of volcanic ash may be deposited in as little time as a few hours and would serve as an absolute time plane. Thin chert layers in the Morrison Formation (Jurassic), possibly altered volcanic ash beds, may represent fallout that was incorporated into the sediments. These thin beds, which may be traced over large parts of Colorado, Utah, Wyoming, Kansas, and New Mexico, serve as excellent reference horizons in this part of the geologic section. Bentonite beds are particularly valuable for correlation in Cretaceous formations; one, of pronounced persistency in the Graneros Shale (Upper Cretaceous), is known as the "bentonite marker bed" because it can be recognized on electric logs in Kansas, Nebraska, Colorado, and possibly Wyoming. Thus, where there are rapid facies changes and marker beds persist through the changes, it is possible to corrdate rocks of equivalent age but unlike lithology. Many other sources of data, in addition to electric and radioactivity logs, have been utilized in this study. Of considerable importance are sample logs prepared from cuttings of rotary and cable-tool wells. In addition to samples examined by me, sample logs prepared by other geologists are available in the Kansas Survey. Many excellent sample logs prepared by Wallace Lee and his associates were of particular value in the study of Mississippian and older units. Logs of the Kansas Sample Log Service were indispensable. Logs prepared by drillers and subsurface stratigraphic markers ("formation tops") reported by oil scouts were used where necessary. Information available for the western part of the state is very satisfactory, but that for the eastern part is not. Although exploration and exploitation have been conducted in eastern Kansas for almost a century, and thousands of tests have been drilled, surprisingly little information is available. Moreover, what is available is generally incomplete, inaccurate, or unreliable. The only information available for most wells is a drillers log. Most of these logs, especially for the older wells, are too brief to be useful. Commonly, formations are described only as lime, shale, and sand; however, such lithologies as soapstone, mud, marble, slate, marl, gumbo, fire clay, and shells are occasionally encountered. More vivid formational descriptions include: broken lime, gray shale, red rock, muddy shale, sloppy sand, big shale, lime shells, and dead sand. Examples of the ultimate in detailed rock descriptions on drillers logs are "black sticky shale," "firm white lime," "light oil sand," and "flinty sharp limestone." Obviously, on the basis of information such as this, only key units can be recognized. Others can be recognized from their stratigraphic position in the sequence, although not always with certainty. It is sometimes impossible to determine the exact location of a well. The sites of many wells are recorded only as to section in a township, and in many old producing areas it is impossible to tell whether one well or several are involved. Determining the surface elevations of well sites presents another problem. Most logs in eastern Kansas do not record elevation, because it is rarely surveyed. As a result, the geologist must compute a well elevation, which may be approximately correct, and, hoping that the well is located in the right place, he uses a drillers log for guessing the depth of key formations penetrated. From such data, duly calculated and plotted, he contours a phantom horizon. The difficulties referred to may be slightly exaggerated, but they should be kept in mind when evaluating subsurface maps and sections illustrating geologic conditions in eastern Kansas. In addition to numerous detailed reports on the stratigraphy, several comprehensive reports have been used, particularly as background for studies of rock nomenclature and classification, as well as for general descriptions; especially helpful were papers by Moore, Frye, and Jewett (1944), Moore and others (1951a, 1952), and Jewett (1959). The Geologic Map of Kansas (Moore and Landes, 1937) was used, with only slight revision, for plotting areal distributions of outcropping formations and groups. Stratigraphic descriptions are as detailed as necessary for adequate understanding of the rock sequence; consequently, some units as small as members must be discussed, whereas in parts of the column only groups are described. Several units in the column have been singled out for more detailed study than others, and they should serve to indicate the complexity of similar units. Discussion of the stratigraphy is organized from the top down, that is, from the youngest rocks to the oldest. This is the arrangement with which the subsurface geologist works; units are described in sequence as encountered by the drill. Cenozoic deposits cover extensive areas in Kansas. Locally they attain considerable thickness, and this mantle of mainly unconsolidated material serves to mask the underlying stratigraphy and structure. The Cenozoic deposits are of great economic value, especially because the ground water they contain supplies the state with a large percentage of its water. Quaternary deposits are relatively thin and consist of sand, gravel, silt, and clay. They are youngest Neogene in age. The Pleistocene geology of Kansas was not studied in detail because: (I) an excellent compilation was published recently by Frye and Leonard (1952), which is the most comprehensive study on this part of the geologic column; (2) the Pleistocene is thin, in most places less than 30 feet, except in the southwestern and northeastern corners of the state, where thicknesses may be several hundred feet; and (3) no bed has sufficient continuity to be used as a datum, either for structural or isopachous mapping. The Pearlette Ash is the only bed that is widely distributed and lithologically distinctive (Pl. 1A, 1C). It is a wind-blown and partly water-laid volcanic ash, which was deposited on an irregular surface and thus incorporated into the sediment at topographically different levels, rendering it almost useless as a structural datum. Plate 1--A, Pearlette Ash in Purex Mine, Meade County (sec. 2, T. 31 S., R. 28 W.). B, Glacial erratic of Sioux Quartzite in city park at 6th and Massachusetts Streets, Lawrence. C, Bedded Pearlette Ash in Purex Mine, Meade County. D, Loess deposit just west of Kansas City on Kansas Turnpike. Pleistocene and Recent deposits in the northwestern part of the state generally consist of loess 2 to 30 feet thick, but loess is considerably thicker in the northeast (Pl. 10). In southwestern Kansas, along Arkansas River in the vicinity of Great Bend and along Cimarron River in Morton, Stanton, and Seward Counties, eolian sand dune areas are extensive. Along the present river systems are alluvial deposits, mainly of Wisconsinan and Recent age, underlying floodplains and terrace surfaces. Alluvial fill ranges in thickness to as much as 80 feet at Lawrence and 100 feet at Kansas City in the Kansas River valley (Merriam, 1954). The alluvial deposits of the Pleistocene consist mainly of unconsolidated silt, sand, and gravel, associated with minor but important beds of volcanic ash. Locally the beds are cemented loosely with calcium carbonate and may resemble the "mortar beds" of the older Ogallala Formation. Thick deposits of glacial origin, restricted to northeastern Kansas, are composed of glacial till, of Kansan and Nebraskan age, and alluvial and outwash material (Pl. 1B). The Pleistocene deposits may attain thicknesses of several hundred feet, overlying bedrock of Pennsylvanian and Permian age. Frye and Leonard (1952, pl. 1) have shown the generalized distribution of the Pleistocene sediments in Kansas and have discussed in some detail the stratigraphic relations of these deposits. Tertiary deposits in Kansas are all of Neogene age and are represented solely by the Ogallala Formation. They are similar to Quaternary deposits, and in several areas, notably southwestern Kansas, it is extremely difficult to differentiate them. The Ogallala Formation was named by Darton in 1899 from outcrops in Keith County, Nebraska. These beds had previously been referred to as part of the Loup Fork Formation, now an obsolete term. Darton considered the Ogallala to be equivalent, at least in part, to the "mortar beds," "tertiary grit," and "magnesia beds" of Kansas. In 1905, and again in 1920, he used the name for deposits of approximatdy the same age extending over most of the Great Plains. Before the name Ogallala (sometimes misspelled "Ogalalla") was proposed, the terms "Tertiary grit" and "Plains marl" had been used by some of the early workers in Kansas, such as Mudge (1874), Hay (1885, 1890, 1895), and Haworth (1897a, 1897b). Since the work of Darton, there have been several notable publications on the Ogallala, including those by Elias (1931, 1932, 1942), Smith (1940), and Frye, Leonard, and Swineford (1956). The latter two contain extensive bibliographies. In addition to these papers, the Kansas Survey has issued many ground-water reports on central and western Kansas counties, many of which include data on the Ogallala Formation. Distribution--Distribution of the Ogallala Formation in the Great Plains is shown in Figure 6; a similar map was published by Hesse in 1938. The outcrop belt parallels the Rocky Mountains for more than 800 miles, from South Dakota on the north to central Texas on the south, and is almost 400 miles wide in places. The Ogallala is present in parts of South Dakota, Nebraska, Kansas, Oklahoma, Texas, New Mexico, Colorado, and Wyoming. The easternmost known outliers of the formation are in McPherson County, Kansas, and Seward County, Nebraska. Figure 6--Distribution of Ogallala Formation in Great Plains. In Kansas the Ogallala covers much of the western one-third of the state. Along the eastern margin of the outcrop, streams have eroded the relatively loose-cemented deposits, exposing Cretaceous strata in the valleys. As an example, erosion by Smoky Hill River has almost severed the continuous outcrop near the Colorado-Kansas border. Excluding the numerous small outliers of "Algal limestone," several outlying Ogallala areas are of notable size, for example, in McPherson, Smith, Osborne, Pratt, Kiowa, and Barber Counties, Kansas, and in eastern Colorado (Fig. 6). These, of course, indicate that the formation was once more widespread in Kansas than at present (Merriam, 1955d). Outliers of "Algal limestone" found in Lincoln County (Berry, 1952, p. 31) may be described as typical. Exposures of the "Algal" unit, overlying weathered Greenhorn Limestone or Carlile Shale, were found at 12 localities in the county, ranging in thickness from a few inches to about 2 feet. The bed consists of "pinkwhite or gray-green limestone containing concentrically banded structures" (Berry, 1952, p. 30). Many of these thin and small outliers of the "Algal limestone" occur east of the main outcrop of the Ogallala Formation. Character--The Ogallala Formation in Kansas is divided into three members (in descending order): Kimball, Ash Hollow, and Valentine. In Nebraska the term Ogallala is used as a group and is divided into four formations (in descending order): Kimball, Sidney, Ash Hollow, and Valentine. Boundaries between members are indistinct; subdivisions of the formation are recognized mainly on the basis of fossil seeds. The Valentine, named by Barbour and Cook (1917; see Lugn, 1939, p. 1260) from exposures near Valentine, Nebraska, constitutes the lowest member of the formation. In Kansas it consists mostly of unconsolidated sands and gravels, but in many places it is cemented by silica (Pl. 2A), forming green opaline sandstone (Frye and Swineford, 1946). Also present in this member are some beds of soft, fresh-water limestone, bentonite (especially at the base), and volcanic ash. The overall color is greenish gray and gray. The Valentine is locally as much as 100 feet thick in Kansas. Plate 2--A, Siliceous Ogallala Formation about 3 1/2 miles south of Glade, Phillips County. B, Nodular pisolitic limestone overlying Ogallala sand and silt above Kiowa Shale in Rice County (N2 sec. 27, T. 19 S., R. 10 W.); photo by Ada Swineford. C, "Mortar beds" in Ogallala Formation on Five Mile Creek, Ford County. D, Ogallala overlying Kiowa Shale (man standing on contact) near Clark County State Lake, Clark County (sec. 36, T. 30 S., R. 23 W.). The type section of the Ash Hollow Member is along Ash Hollow Canyon in the North Platte River valley, Keith County, Nebraska. This member was first named by Engelmann in 1876 (see Lugn, 1939). It consists of sand, gravel, and silt, and in many places is loosely cemented by calcium carbonate to form "mortar beds" (Pl. 2C). Fresh-water limestone and relatively large amounts of volcanic ash are found also. The ash occurs in at least ten separate beds, six of which have been given formal names (Swineford, Frye, and Leonard, 1955). The predominating colors are pink and gray. Thickness of the Ash Hollow in Kansas is as much as 130 feet. The Sidney, which has not been given member status in Kansas, is found as lenticular gravels in some localities at the base of the Kimball Member. The type section is just north of Sidney, Nebraska (Lugn, 1939). The uppermost member, the Kimball, receives its name from Kimball County, Nebraska (Lugn, 1939). In Kansas it consists of calcareous sand, gravel, and silt, as well as minor amounts of opaline chert and caliche. The color is mostly very light gray. Locally developed at the top of the member is the "Algal limestone" (Pl. 2B), a dense, sandy limestone showing concentric layering; it is sometimes called the "capping limestone" or "cap rock." The "Algal limestone" was so named by Elias (1931) because of the presence of structures that he thought closely resembled the fossil alga Chlorellopsis bradleyi. The exact origin of the limestone, however, has been a subject of controversy ever since Elias first suggested that it was formed in an extensive lake that he postulated to have covered a large part of the High Plains area of Kansas (Merriam and Frye, 1954, p. 55). Alternate hypotheses as to its origin have included development as soil caliche on the alluvial plain, and in a series of disconnected water-table lakes judged to have existed in abandoned channel segments and "back-swamp" areas on the initial eastward-sloping constructional surface (Frye, 1945a). Swineford, Leonard, and Frye (1958) maintained that the bed developed mainly as a result of inorganic soil-forming processes, and they cited evidence that the rock is not algal in origin. Thus the question of origin of this limestone bed is not settled. Regardless of its origin, the stratigraphic position of the bed is unquestioned. A list of "Algal limestone" localities in Kansas is given in Appendix A.
Thickness--Between Smoky Hill and Republican Rivers in northwestern Kansas the Ogallala has a maximum thickness of 300 feet, known from subsurface test-hole information. Figure 7 shows the thickness of the Ogallala Formation in northwestern Kansas, north of Hamilton, Kearny, and Finney Counties. Because both the upper and lower contacts are erosional, the thickness of the formation is very irregular. In southwestern Kansas the thickness may be as much as 600 feet, but the upper and lower limits of the formation in this part of the state have not been determined; therefore, no isopachous map was attempted. Figure 7--Isopachous map of Ogallala Formation in northwestern Kansas. Outcrop has been intricately dissected by westward-heading streams and almost severed in Kansas by Smoky Hill River in Wallace, Logan, and Gove Counties. A larger version of this figure is available. Cardwell (1953) has reported that the thickness of the Ogallala in parts of Cheyenne, Kit Carson, and Lincoln Counties, Colorado, ranges from a featheredge to several hundred feet. The "Algal limestone" in this area ranges from 2 to 3.5 feet in thickness and is remarkably uniform. His map shows configuration of the erosion surface developed on the Pierre Shale in the area. According to McLaughlin (1954), the thickness of the Ogallala Formation in Baca County, Colorado, ranges from a featheredge to about 260 feet. According to Lugn (1939, p. 1264), thickness of the Ogallala in Nebraska ranges from 0 to 500 feet. Stratigraphic Relations--The Ogallala was deposited on a surface of moderate relief by eastward-flowing streams. Deposits gradually filled the pre-Ogallala valleys, and, near the close of deposition, sediments merged across former bedrock divides and coalesced to form a plain of alluviation (Merriam and Frye, 1954, p. 55). It was on this surface that the "Algal limestone" was deposited. Figure 8 shows a stratigraphic cross section of the Ogallala Formation from Scott County to Cheyenne County, Kansas; the datum is top of the "Algal limestone." Where the "Algal" has been removed by post-Ogallala erosion, the original thickness was estimated. Because this cross section is approximately at right angles to the direction of stream flow that deposited the formation, it shows nicely the stratigraphic relations of the Ogallala to the older bedrock. It can be seen that the Ogallala deposits first filled the pre-Ogallala valleys and then coalesced over the bedrock divides. Correlation of any beds in the sequence, except the "Algal limestone," is extremely difficult beyond short distances. Part of the difficulty in correlation is probably caused by variations in the deposits produced by lateral shifting of streams in the valleys. Figure 8--South-north cross section from Scott County to Cheyenne County showing general lithology and stratigraphic relation of beds of Ogallala Formation in western Kansas. Note topographic relief on pre-Ogallala surface and lenticularity of individual beds. Datum: top "Algal limestone." Both a larger version and a very large verison of this figure are available. After uplift of the territory west of Kansas near the end of the Pliocene, streams began to incise the soft Ogallala sediments. In places in southwestern Kansas the Ogallala was eroded to a depth of nearly 500 feet. These valleys later were filled with Pleistocene deposits, mainly reworked Ogallala sediments, which subsequently were partly eroded. The restored thickness of the Ogallala Formation is indicated in Figure 9. This is a convergence map constructed by superimposing structure on top of the "Algal limestone" on pro-Cenozoic bedrock topography. This should show the original thickness of the formation, if deposition had proceeded to the extent that the "Algal limestone" covered the entire area. It is probable, however, that the "Algal" never constituted a continuous bed, Originally the maximum thickness of the formation may have been more than 800 feet in southern Seward and Stevens Counties. It is possible that some of the sediments are Miocene in age, but the absence of observed fossils in samples makes this impossible to determine. 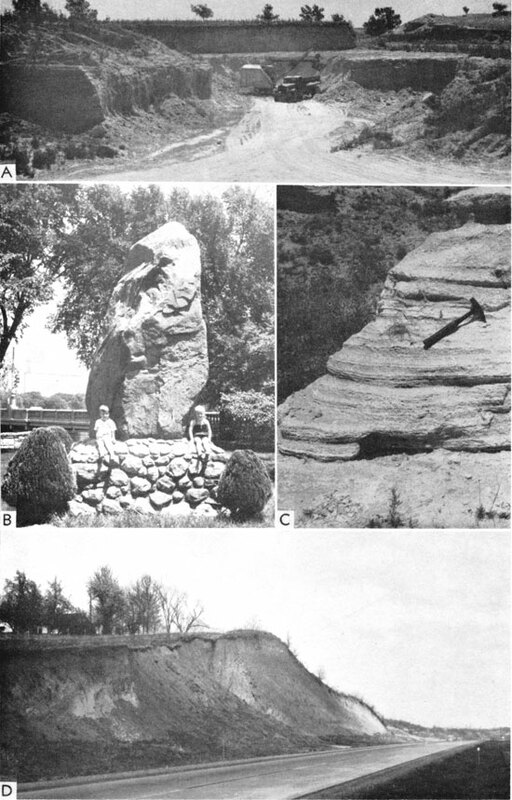 Several prominent bedrock "highs" (including one extending east-west just north of the present Smoky Hill River, another in Wichita County, and a third in Greeley County) also are shown in Figure 9. Figure 9--Convergence map showing restored thickness of Ogallala Formation from top of "Algal limestone" to top of Mesozoic bedrock. Crooked Creek, Fowler, Syracuse, Elkader, and Monument Rocks faults are shown. Contour interval 100 feet. A larger version of this figure is available. In southwestern Kansas determination of the relationship between Pleistocene and Pliocene sediments is a difficult problem, especially in the subsurface. It is almost impossible to recognize the boundary between them in well samples, and difficult even on the outcrop, where exposures are poor. This difficulty can be attributed to the lack of discovered fossils in samples and to the fact that the lithology of much of the Pleistocene is nearly identical to that of the older Ogallala Formation, from which much of it was derived. In 11 southwestern Kansas counties--Stanton (Latta, 1941), Morton (McLaughlin, 1942), Hamilton and Kearny (McLaughlin, 1943), Finney and Gray (Latta, 1944), Grant, Haskell, and Stevens (McLaughlin, 1946), Kiowa (Latta, 1948), and Seward (Byrne and McLaughlin, 1948)--the Pleistocene and Pliocene were undifferentiated or separated questionably on the basis of sample logs of ground-water test wells. Schoff (1939, 1943) also had difficulty in separating with certainty the Pleistocene and Pliocene deposits in well samples in Texas and Cimarron Counties, Oklahoma. Elias (1948), on the other hand, has cited several criteria for differentiating the Ogallala from post-Ogallala (Pleistocene) deposits. Among these are observations that: (1) the Ogallala contains some cementing calcium carbonate, whereas Pleistocene deposits are mostly noncalcareous; (2) silicified seeds are present in the Ogallala but unknown in the Pleistocene except by redeposition; (3) post-Ogallala sediments are distinguished by a content of unctuous clays; and (4) Pleistocene deposits are characterized by the occurrence in many places of shells of snails and clams, which are rare or lacking in the Ogallala. At the same time, Elias has noted that in the northeastern Great Plains the division between Pliocene and Pleistocene is difficult to recognize. The description by Frye, Leonard, and Swineford (1956) of a molluscan faunal succession in the Ogallala seems to indicate that Elias' fourth criterion is no longer valid. The first criterion may not be everywhere usable, because the Pleistocene deposits may be locally loosely cemented with calcium carbonate (see Frye, 1948). Where the "Algal limestone," the recognized top of the Pliocene deposits in Kansas, is present, the difficulty is resolved. Environment of Deposition--Smith (1940) thoroughly discussed the origin of the Ogallala Formation, and the following are some important conclusions resulting from his study: (1) the Ogallala was deposited as a warped and dissected piedmont alluvial plain; (2) sedimentary materials were derived mainly from the Rocky Mountain region; (3) deposition of the Ogallala was mainly of channel and floodplain type, whereas eolian deposition was of minor importance; and (4) cause of deposition was a combination of climatic change and tectonic factors. Figure 10 is a clastic-ratio map of the Ogallala Formation. At first glance, distribution of clastic and nonclastic materials appears to be very irregular; a vaguely discernible pattern, however, reveals several interesting features. North of the present Smoky Hill River valley the trend of coarser clastic materials is in a northeast direction. No pattern indicates any single former stream valley, possibly excepting one in Cheyenne County. In this part of Kansas elongation of the coarser clastic areas indicates that drainage was northeastward in Ogallala time. South of Smoky Hill River valley in Greeley, Wichita, and Scott Counties, the pattern of clastic distribution indicates a western source of the material. South of a line drawn along the north side of Hamilton, Kearny, and Finney Counties, the coarse clastic material is concentrated in a belt trending southeastward, reaching to Meade County in an area now known as the Meade Artesian Basin. This distribution seems to indicate that Ogallala streams in southwestern Kansas flowed southeastward and that the source of material carried by them was to the west and northwest in Colorado. Figure 10--Map of Kansas showing clastic ratio limits of sediments in Ogallala Formation (Pliocene). Note elongated areas of coarser clastics, which indicate general areas of channel deposition. A larger version of this figure is available. The described pattern is very similar to that of present-day streams of the region and to the distribution of the Ogallala Formation as shown by Smith (1940, p. 81). This pattern of semiradial drainage diverges from an area in east-central Colorado that is a pronounced physiographic "high" not far east of the Front Range. The clastic-ratio pattern, in general, shows the distribution of major drainage systems during deposition of the Ogallala Formation, and it indicates that the main streams were remarkably similar in geographic location to older channels cut on the pre-Cenozoic bedrock surface (Fig. 11). Because the pre-Cenozoic topographic bedrock map and the clastic-ratio map of the Ogallala, as well as present drainage, indicate a stable drainage pattern, it is believed that the physiographic "high" east of the Front Range in Colorado existed at least as early as the end of Miocene time. This conclusion agrees with that reached by Smith (1940). Nevertheless, it is probable that the area west of Kansas was upwarped and its eastward slope accentuated by post-Ogallala uplift. If the conclusions just stated regarding Pliocene drainage patterns are correct, any Ogallala sediments derived directly from the Rocky Mountains could have been deposited only in the southwestern part of Kansas, because Arkansas River is the only Kansas drainage system heading in the mountains proper. Streams flowing through northwestern Kansas originate east of the mentioned physiographic "high," indicating that materials of the Ogallala Formation in this area must have been derived from areas east of the Rocky Mountains. Age and Correlation--The age of the Ogallala is Pliocene, as shown by the vertebrate and molluscan fauna and the flora. Wood and others (1941) have interpreted the Ogallala as late Sarmatian, Pontian, Plaisancian, and earliest Astian, in terms of European Cenozoic stages. In eastern Colorado the equivalent of the Ogallala is the Nussbaum Formation, which Gilbert (1897) named from Nussbaum Spring, near the south end of Baculite Mesa. The Nussbaum consists chiefly of loosely cemented sand and some silt, but it contains pebble lenses at various levels. It is about 100 feet thick. The Laverne Formation in southwestern Kansas is equivalent to the Valentine Member of the Ogallala Formation (Moore and others, 1951a, p. 20). 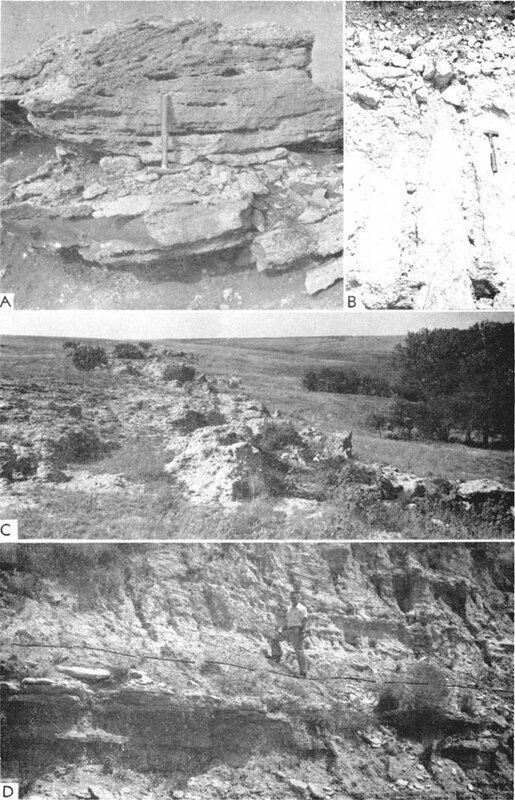 Before deposition of the Ogallala Formation, Kansas was extensively eroded and rock many hundreds of feet thick was stripped away. Cretaceous sediments were beveled (Pl. 20), and in central and eastern Kansas completely removed, so as to expose Permian and older rocks. This erosion probably was intermittent, as indicated by local deposition and preservation of lower Tertiary sediments in eastern Colorado near the Rockies. In Kansas, considerable local relief was developed on this erosional surface, which was by no means a peneplain. The configuration of the surface in part of western Kansas is represented in Figure 11. Figure 11--Map showing topography of surface below Cenozoic deposits of western Kansas (adapted from Merriam and Frye, 1954). Contour interval 100 feet. A larger version of this figure is available. Subsurface control for this map is almost entirely derived from test holes drilled by the cooperative Ground-Water Division of the State and Federal Geological Surveys. Distribution of these data, although not uniform throughout the region, is believed to be sufficient to permit drawing of 100-foot contours. Contours drawn on the unconformity at the base of Cenozoic deposits show a composite erosional surface of several ages (Merriam and Frye, 1954). North of Arkansas River, except in Scott and Finney Counties, this is the surface on which the Ogallala Formation was deposited; therefore, it is the surface of subaerial erosion that existed at or near the close of Miocene time. Four major pre-Ogallala valleys are outlined by the contours. The northernmost one extends eastward from southern Cheyenne County through a broad and somewhat indistinct trough to western Phillips County. Farther south, a valley trends eastward from central Wallace County in the approximate position of the present Smoky Hill Valley. A third valley extends east-southeastward from southeastern Wallace County, and a fourth trends southeastward from the southeastern corner of Greeley County. These valleys are separated by bedrock divides. South of Arkansas River, the only surface that may be safely identified as a predominantly pre-Pleistocene development is in Morton and Stanton Counties and southern Hamilton County, but even here the suggested valleys coincide with the upper reaches of valleys farther east which are known to have been occupied by Pleistocene streams (Merriam and Frye, 1954, p. 57). Therefore, in this region either Pliocene and Pleistocene valleys fortuitously coincide, or Pleistocene erosion removed the Ogallala Formation and incised bedrock as far west as the Colorado-Kansas line. From Grant and Stevens Counties eastward to Kiowa County the bedrock topography (Fig. 11) is a complex pre-Ogallala surface, which was incised to various depths by at least two episodes of erosion during Pleistocene time. A major southward-trending early Pleistocene valley (Frye and Leonard, 1952) is incised below the pre-Ogallala surface southward from central Scott County, and in central Haskell County it is joined by a major tributary from the west. In Meade County the trend of this major valley system is obscured by the Crooked Creek and Fowler Faults. Another major Pleistocene valley extends from eastern Gray County southeastward into northern Comanche County. A prominent bedrock divide that trends southeastward from northern Ford County across Kiowa County into northwestern Barber County separates the early Pleistocene drainage systems of southwestern Kansas from those of the south-central area, or Great Bend region, Eastward from Kiowa County the bedrock topography was developed, essentially in its entirety, by Pleistocene erosion. In this area the bedrock valley systems have been described by Fent (1950b), and the drainage patterns he indicated generally agree with the features shown in Figure 11. An integrated system of bedrock valleys trends east-southeastward under the region from central Kiowa County to central Reno County, limited on the northeast by a distinct divide, which is roughly parallel to and south of the present position of Arkansas River in Reno County. Northeast of this divide, the prominent Kansan-age McPherson valley and its tributary from the northwest are shown distinctly by the contours (Merriam and Frye, 1954, p. 58).